Cook rice in rice cooker. When done cooking, transfer rice to mixing bowl and fold in sushi seasoning. Set aside to cool. Combine imitation crab with mayonnaise. Layer half of sushi rice in 8×8 pan and press down with another 8×8 pan. Layer avocados, cucumbers, and imitation crab, then top with rest of sushi rice. Press down with 8×8 pan. 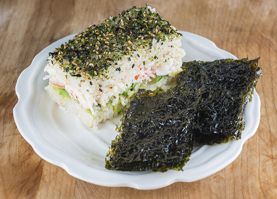 Sprinkle Nori Komi furikake on top of entire dish, cut into bite size pieces, and serve with Korean seasoned nori.